1 of 3 Coat slow-cooker bowl with nonstick cooking spray. Season beef with 1/2 tsp of the salt and 1/4 tsp of the pepper. Place in bottom of slow cooker. 2 of 3 Scatter onion, garlic, carrots, parsnips, turnips, potatoes and thyme over beef, in that order. Pour broth over top. 3 of 3 Cover and cook on HIGH for 5 hours or LOW for 7 hours. Drain liquid from slow cooker into a small saucepan and bring to a simmer. In a small bowl, combine cornstarch with 2 tbsp water and stir until combined. Slowly stir into saucepan and simmer 1 minute or until thickened. Season with remaining 1/2 tsp salt and 1/8 tsp pepper. 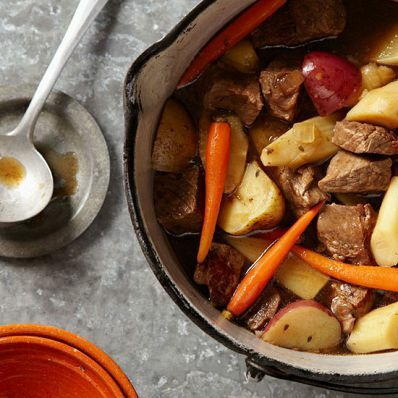 Stir liquid back into slow cooker and serve. Per Serving: 0 null Mark as Free Exchange, 574 mg sodium, 35 g pro., 6 g fiber, 36 g carb., 3 g sat. fat, 64 mg chol., 7 g Fat, total, 364 kcal cal.